The move comes tonight in the wake of a US court decision in Albuquerque, New Mexico, in which the court decided to granted a temporary restraining order against RIM. 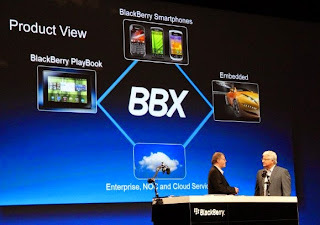 BASIS requested the order, as a part of an ongoing saga after it sued RIM over the BBX trademark, arguing that the company has been using it for its own operating system since 1985. RIM was about to hold a developer's conference in Singapore, where it would have talked up its BBX future. Despite RIM's jurisdictional argument (it's a Canadian company holding an event in Singapore, after all), the company lost this round. In fact, given the name change here, it looks as though RIM decided that it was going to lose the entire battle. BASIS was understandably pleased by the decision, going so far as to put out a press release linking to the ruling. Shortly after the ruling came down, RIM's tweet went up — and we now have a new name for RIM's upcoming OS: BlackBerry 10.